… Hangout infuses everything you want out of the ideal music festival with your dream vacation. 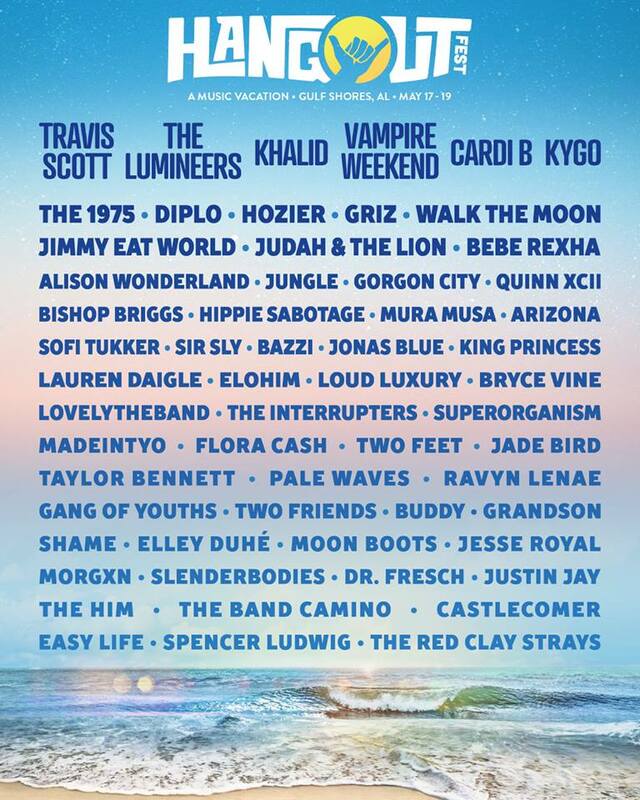 Hangout Festival keeps escalating in the ranks of world-class performances every year and 2019 is no different. Splitting the headling slots are artists ranging from EDM to alternative to rap to pop to good ol' rock-n-roll: Travis Scott, The Lumineers, Khalid, Vampire Weekend, Cardi B and Kygo. That sample right there tells you Hangout 2019 is the business. Throughout the rest of the three days are a multitude of bands that would make an alt-lovers dreams come true: ARIZONA, Superorganism, Mura Musa, Judah & The Lion, The 1975, Bishop Briggs, Sir Sly, Lovelytheband… just to name a few. Also on the rundown are radio airwave giants like Diplo, Hozier, Griz, Jimmy Eat World, Bebe Rexha, Walk the Moon and Quinn XCII. Love EDM? Enjoy Alison Wonderland, Sofi Tukker, grandson and more. The hauntingly awesome world of grandson… what a treat. How about some reggae and ska? Reggae revival colossal Jesse Royal joins the list, as well as the ska band on everyone's radar right now, The Interrupters. Needless to say, there's a little something for every style.